High-quality lawn turf, laid by your local experts. If you are landscaping a new garden, or you just want to replace a flower bed or tree stump with an attractive turfed area, Lawn & Weed Expert’s turf layers are the people to call! Call 0800 111 4958 to request a free, no-obligation quote for Lawn & Weed Expert’s professional turf services. 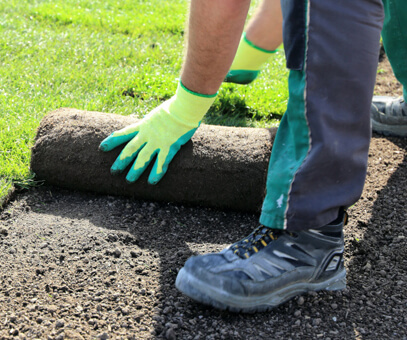 Laying Turf: Why Choose Us? Lawn & Weed Expert have more than 20 years’ experience in this field, and we offer a variety of professional turf laying services for your outdoor space. Artificial turf is an increasingly popular alternative to real grass, but we urge you to think carefully before you buy. Ask your supplier how long their turf stays green before the sun’s ultraviolet rays bleach it yellow – artificial grass isn’t cheap, so you need to be sure that whatever you purchase will last longer than a couple of years. We supply and deliver turf throughout South Wales, and lay hundreds of square metres of turf each year. Our quotations are easy to understand, free of charge, and come with no obligation. We can arrange a seasonal lawn treatment programme and our turf layers will return periodically to make sure your new lawn is looking good and growing healthily. If we think you could save money by repairing your existing lawn rather than laying new turf, we will tell you so. We use hard-wearing utility turf that is ideal for conditions in this part of the UK. Our prices are extremely competitive – contact us today to request a free quote for your garden turf requirements.